With plenty of reviewed smartphones behind our back, we are always interested in checking interesting combinations of chipset and battery that show impressive battery life results. The best combination so far includes the MediaTek Helio P23 system-on-chip and 6000 mAh and even larger batteries - up to 11000 mAh. There has been a claim for a 12000 mAh battery but that turned out not to be true. So this combination of a large-capacity battery and extremely power-efficient chipset yields more than impressive battery results. 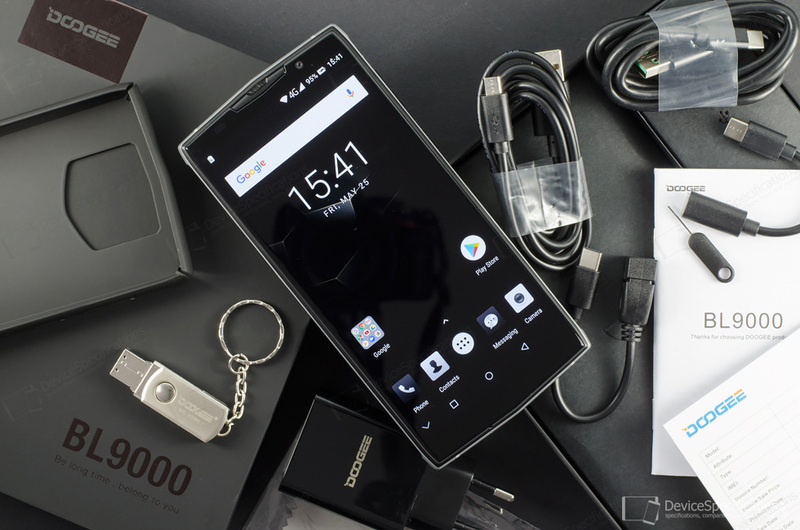 Hence, when we were offered the Doogee BL9000 we knew from the start this device will top our rank for longest battery life. In addition to our in-house developed battery life and charging tests, we will also make the usual measurements, benchmarks and additional tests that will give you a full and detailed "portrait" of the BL9000. 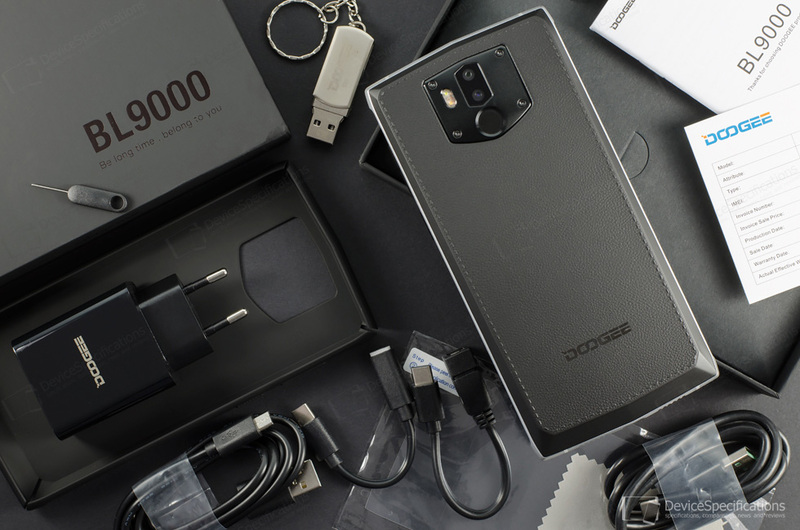 You can buy Doogee BL9000 at a promotional price directly from Doogee or from Banggood. The first 999 orders get a free wireless charger. Doogee BL9000 features a 5.99-inch IPS display from LG with an FHD+ resolution (1080 x 2160 pixels) and a 2.5D curved glass. It graces a solid body with a metal frame and hard plastic back that resembles the pattern of real leather. Under this plastic hood, a MediaTek Helio P23 (MT6763V) chipset ticks using an octa-core Cortex-A53 CPU with four 2.34GHz Cortex-A53 cores and for 1.75GHz ones. A dual-core 770MHz Mali-G71 MP2 GPU manages the graphics department. The model features 6GB of dual-channel LPDDR4X RAM clocked at 1600MHz and 64GB of eMMC 5.1 internal memory that can be expanded with up to 128GB. The camera department includes two rear shooters and a front-facing snapper with face unlock. The main rear camera packs a 12MP Sony IMX486 Exmor RS sensor paired with an f/2.8 lens, dual-tone LED flash and dual PDAF. The auxiliary rear camera is equipped with a 5MP sensor and ArcSoft tech for providing more depth of field when shooting in SLR mode. On the front, an 8MP GalaxyCore GC8024 snapper sits combined with an 88-degree lens with an f/2.8 aperture, moonlight selfie LED flash and face unlock function. Power is supplied by a 9000 mAh battery paired with a 5V/5A flash charger that supports MediaTek Pump Express 4.0. It also supports 10W wireless charging. The smartphone supports 2G GSM (850, 900, 1800, 1900 MHz), 3G WCDMA (900, 2100 MHz), and 4G LTE-FDD (800, 900, 1800, 2100, 2600 MHz) network bands with LTE Cat. 7 speeds. Both SIM cards on the dual Nano-SIM/microSD slot support 4G LTE. The wireless connectivity options include dual-band Wi-Fi 802.11 a/b/g/n, Wi-Fi Hotspot, Wi-Fi Direct, Wi-Fi Calling, and Bluetooth 4.0. The device is equipped with a rear-mounted fingerprint sensor, a USB Type-C 2.0 port with OTG support and lacks a 3.5 mm jack. It runs on Android 8.1 Oreo with Doogee OS 2.0 on top.